Puerto Rican entrepreneurs Lucienne Gigante and Carlos Cobián created this event to provide a space in which women get inspired, learn, connect and gain access to opportunities for growth and transformation. Regardless of their career level, from students to presidents and business owners, every attendee has something to gain from the event, they said. “Investing in the economic development of women is a solution to grow and transform countries. Women are making way and growing businesses at a fast pace, and we need tools for scalable growth,” Animus co-founder Lucienne Gigante, who has developed innovation and economic development program for women for more than 10 years. 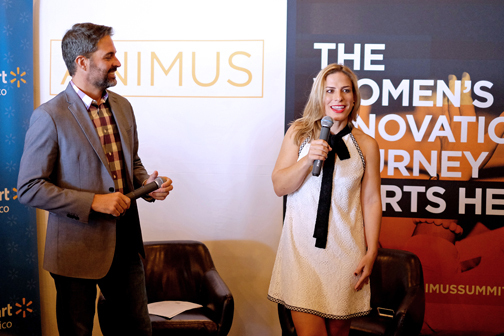 “Animus invites you to think big, it opens doors, it connects you and gives you the chance to listen to great stories, of both failure and success, which can guide people of all ages and career stages,” she said. To broaden the range of experiences presented at the event, each edition of Animus hosts an all-encompassing selection of leaders, from every age and industry, who have broken the frameworks in their respective fields and become role models for success. “It is well-documented that women-led businesses have a higher ROI than those not led by women. Appointing women to leadership positions is a smart business move,” said Animus co-founder Carlos Cobián, who is also the founder of Cobian Media. “That is why, at Animus, we’re empowering them with the right tools and with skills they can put to practice right after the event,” he said. Animus is a dynamic event that offers several formats, from short five-minute presentations, talks and work-related anecdotes to magisterial conference sessions and panels. It will also feature a mentor booth in which attendees can schedule one-on-one meetings with the speakers. This edition of the Summit will also debut the “A+ Marketplace,” a creative space to showcase and promote innovative companies led by women. The purpose of this space is highlighting businesses with a unique proposition that are “making noise” in the art, fashion, services, technology, entertainment and manufacturing industries. To achieve this goal, a group of business leaders will select the A+ companies that will be part of this marketplace. Some 30 businesswomen will have the chance to showcase their products to more than 800 people expected to attend this marketplace. Papaya Tropical – Vanessa Vélez leads this social responsibility educational movement, discussing topics related to sexuality and others considered stereotypical or taboo. Boca Ciega Style Market – Gabriela Durán is a Puerto Rican living in L.A. From there, she manages this ecommerce that focuses on promoting talented Latin American designers in the U.S. market. ISLA Language – Sacha Delgado directs this atypical language school where educational elements are combined with tourism, social and cultural activities to provide a language-learning experience unlike any other. Lote 23 – Cristina Sumaza co-founded this gastronomical park where chefs, artists and musicians showcase their creative proposals while the community is integrated, entertained and fed in a fun-for-all ambiance in Santurce. OM Studio – Known as “the queen of curls”, Laura OM created and maintains this beauty salon in which the Latino race is embraced and celebrated through every hair styled. The salon also promotes an all-around healthy lifestyle, from its natural hair care product offer to her collaboration with local microenterprises. Co Haus – Caroline López Beauchamp and María de los Ángeles Rosas created this coworking space at the heart of Santurce. Its focus is providing an ambiance that promotes collaboration, in a way that each community member feels inspired and is productive. Executive Virtual Assistants PR – Through this business model, Michelle Brown and her team provide remote, or virtual, administrative services. Using the advantages of the internet, the assistants take care of every administrative task its client businesses may need, allowing those companies to reduce operating costs and to focus on their businesses. In response to suggestions from past attendees, this edition of Animus brings a series of workshops to dig deep into key topics of professional and business development. These include leadership, positioning, and social media strategy, among others. This year, the Startup Showcase also returns. It is a platform in which five women-led companies present their business proposal. Jossie Edmée Arroyo, founder of Bien Cool, is one of the entrepreneurs who will present their companies and plans for growth. Bien Cool is a creative business dedicated to selling greeting cards, agendas and gifts with a very tropical and distinctively Puerto Rican touch. “At the first Animus summit, executives from Walmart introduced me to Walgreens executives. That is how we built the relationship that resulted in distributing our greeting cards at the points of sale of both chains. Where else could I have possibly made those connections?” said Arroyo about its previous Animus experience. Hey Buddy!, I found this information for you: "Animus innovation summit returns Oct. 6". Here is the website link: https://newsismybusiness.com/innovation-summit-returns/. Thank you.